Lyft has partnered with workplace benefit companies to give an extra discount to Lyft Line commuters in four cities. 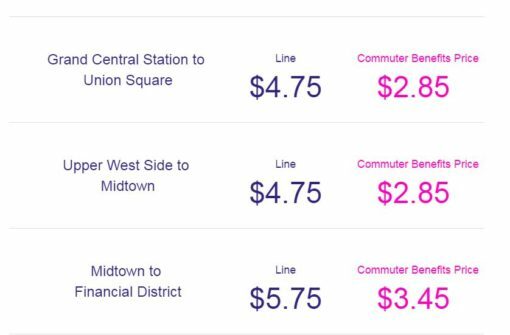 Now if you have WageWorks®, Zenefits, Benefit Resource, Commuter Benefit Solutions, or Navia, you can add your commuter benefits card to the Lyft app for additional discounts on Lyft Lines (and only Lyft Lines). Premiering in four cities New York City, Boston, Seattle, and Miami, Lyft users can use their pre-tax dollars for commuting purposes — and save up to 40%. It sounds simple, just add your commuter benefits prepaid card as a payment method in the Lyft app before calling your Lyft Line. After adding, choose Line and select your commuter card as the payment method for that ride. We wish it was that simple, but there’s always a caveat, isn’t there. The rub? You better not be in a rush and unlucky because Lyft says that you’ll be matched with a vehicle with up to six passengers, all traveling the same way as you. SIX? We’re not saying that you’ll have to Brady Bunch it to work every single time, but the prospect of picking up five other passengers is kind of scary. Hell, we struggle when we have two other pick ups, can you imagine stopping 3-4x on your way to work? It’s great if you’ve got time on a rainy morning otherwise, you’re going to be late for your 9AM meeting. I updated my Android app and added my WageWorks card to give this a shot. In my couple intial tries, there was no difference in fares when I swapped in/out my commuter benefits card. It’s early, I know, but I hope there’s a way I can tell how much additional I am saving by using this feature. Stay tuned.